Plantar Fasciitis. By now, you’ve probably heard this diagnosis term thrown around among friends, coworkers, or family members. It seems like everyone and their brother has struggled with this nagging foot pain. 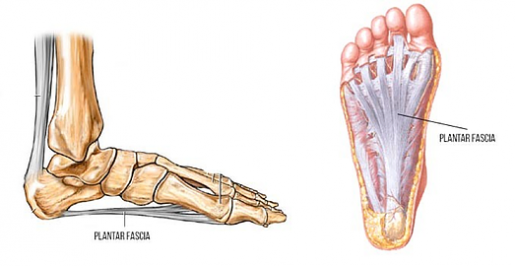 So, what exactly is plantar fascia? Fascia is a type of connective tissue that can be found all over the body. It is a thin – but strong – substance that helps support many other tissues. For a more in-depth look at fascia, check out one of our past blogs here. Plantar fascia refers specifically to the connective tissue along the bottom of the foot, as shown on the right. In a healthy, active person with appropriate arch support, the plantar fascia usually goes unnoticed. However, in individuals with poor arch support, weak muscles of the lower leg and foot, or “flat feet,” the plantar fascia is put under increased pressure. When this happens, the pain is usually described as “tight” and “sharp.” This irritation is called plantar fasciitis. So, what are some ways to prevent plantar fasciitis and keep your feet happy and healthy? First, maintaining a strong, supported arch in the foot is crucial. If you are someone who has “flat feet” or finds that your plantar foot hurts with running and other weight-bearing activities, consider changing your footwear to better support your body. Some stores specialize in matching foot shape and structure to the appropriate pair of footwear. Also, health care professionals such as physical therapists, athletic trainers, and/or podiatrists can recommend footwear for you. In addition, exercises to strengthen the muscles that help make up the arch of your foot can be very effective at keeping foot pain at bay! Keep an eye out for our spring newsletter which highlights some of these! In addition, massaging or loosening the plantar fascia can be helpful in limiting pain. In a sitting position, place a tennis ball underneath the arch of your foot. Use your foot to roll the ball along your arch, massaging and working the fascia and musculature. You can also do this with a lacrosse ball for increased pressure. Last, if you have developed pain on the bottom of your foot, don’t wait for it to become excruciating before seeking out help. Often, some easy self-care tips and exercises given by your local rehab specialist (PT, PTA, ATC, etc.) can get you back on the right track and back to enjoying the exercises and activities you love! WARM-UPS SHOULD BE DYNAMIC... AND FUN!